For the second consecutive year, UC San Diego has reached a milestone for contract and grant funding, supporting its rank as 5th in the nation in sponsored research. Professor Neal Devaraj (left) and student. Photo by Erik Jepsen/UC San Diego Publications. The University of California San Diego received $1.160 billion in sponsored research support in FY2017 (July1-June 30), a 3 percent increase from FY2016’s total of $1.126 billion. This marks the second consecutive year in which UC San Diego broke its own previous record. Overall, the university ranks 5th in the nation in sponsored research. Funding to UC San Diego from federal agencies neared $693 million, with the biggest contributions coming from the Department of Health and Human Services, the Department of Defense and the National Science Foundation. $398 million came largely from private industry awards as well as the State of California. $69 million of the funding was raised from private research gifts. The majority of the funding—nearly $660 million—was earned by health sciences, which includes UC San Diego School of Medicine, as well as Skaggs School of Pharmacy and Pharmaceutical Sciences. Academic Affairs earned $284 million, and covers the school’s academic divisions and organized research units. Scripps Institution of Oceanography was awarded over $143 million. 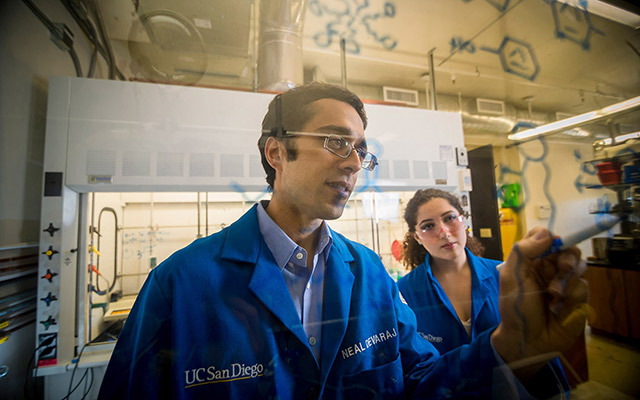 UC San Diego faculty depend on research funding to support innovation and discovery. For example, the U.S. Department of Energy awarded the school $750,000 through its SunShot Initiative, designed to reduce the cost of solar electricity and promote solar adoption. UC San Diego nanoengineering professor David Fenning is the principal investigator on the project. His team’s work will focus on detecting moisture in photovoltaic modules and assessing how moisture affects performance. Fenning believes this study can ultimately lead to more efficient and more long-lasting solar installations. In addition, the National Institutes of Health (NIH) awarded the Amazonian Center of Excellence for Malaria Research $8.3 million over the next seven years to continue its work studying malaria epidemiology. The center is a collaboration between several universities located around the world. Joseph Vinetz, M.D., professor of medicine specializing in tropical disease and hygiene at UC San Diego School of Medicine, is the principal investigator and says the work the center does has already been impactful in studying the ways malaria can be transmitted between humans and mosquitos. UC San Diego also increased the number of funding proposals and total project cost (potential award) submitted this fiscal year. The number of proposals reached 4,719 with the total potential award crossing the $4 billion mark. The grants for which these proposals were submitted will be awarded in the next year.